We found ourselves in Cincinnati last weekend because of the Tennis, not because of any desire to see the place but we did get some time to explore. The city itself isn't big (pop 300,000) but the commuter belt extends into what they call the tri-state area of south-west Ohio, northern Kentucky and the south-east of Ohio. Cincy is one of America's oldest settlements and whilst downtown itself is reserved for business it is surrounded by pretty residential areas in three states - Ohio, Kentucky and Indiana. Most of the activity downtown is centered around Fountain Square, which has been the symbolic center of Cincinnati since 1871. Today Fountain Square and the rest of the city is seeing a real influx of new development and private investment, specifically along the Ohio river. Both the Bengals (American football) and the Reds (baseball) play in brand new stadiums situated in acres of space along the riverfront, and the whole area has a feel of 'what could be' about it. More can be read on the plans for re-development here. A place of interest is the multi-purpose U.S. Bank Arena, originally known as the Riverfront Coliseum. It is here Elvis did one of his final live performances before he died and it was also witness to 11 people dying in a crush at a Who concert in 1979. Today it is still a concert and sports arena. The Ohio River is punctuated with some intriguing looking bridges. 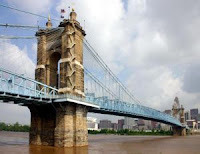 Tower Bridge lookalike, the John A. Roebling Suspension Bridge (top left) crosses into Covington, Kentucky. The yellow Daniel Carter Beard Bridge takes you into Newport, Kentucky as does the Newport Southbank Bridge, known locally as the Purple People Bridge which stretches 2,670 feet into Newport on the Levee, which is nice residential area with a purpose built restaurant and cinema complex. There is also an aquarium. Walking around the leafy streets of Newport, you can't miss seeing or hearing the World Peace Bell, the largest swinging bell in the world weighing in at 73,381lb! It is said that the bell only rings on special occasions, but at midday on Sunday it was ringing loud and clear. To get around a car is probably a necessity, there are buses, but I would guess infrequent as I only saw one when we were there. A new streetcar system is expected to be completed by 2009.